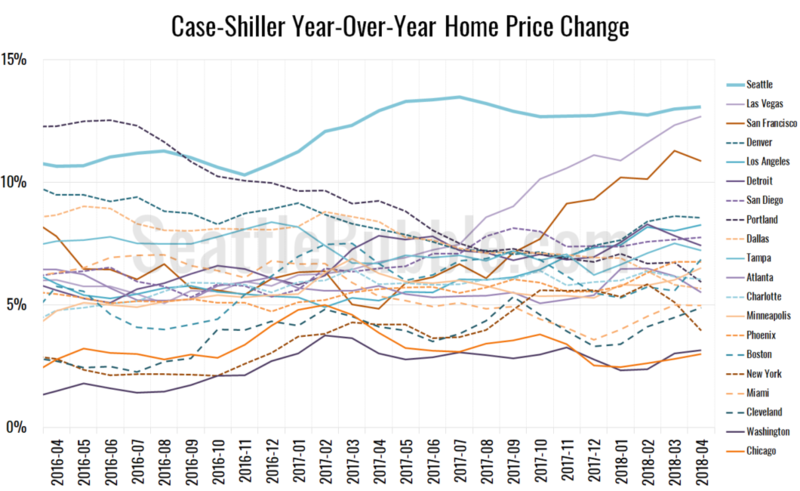 I’ll be posting the monthly stats preview data later today, but Case-Shiller was specifically requested, so here’s the latest update. 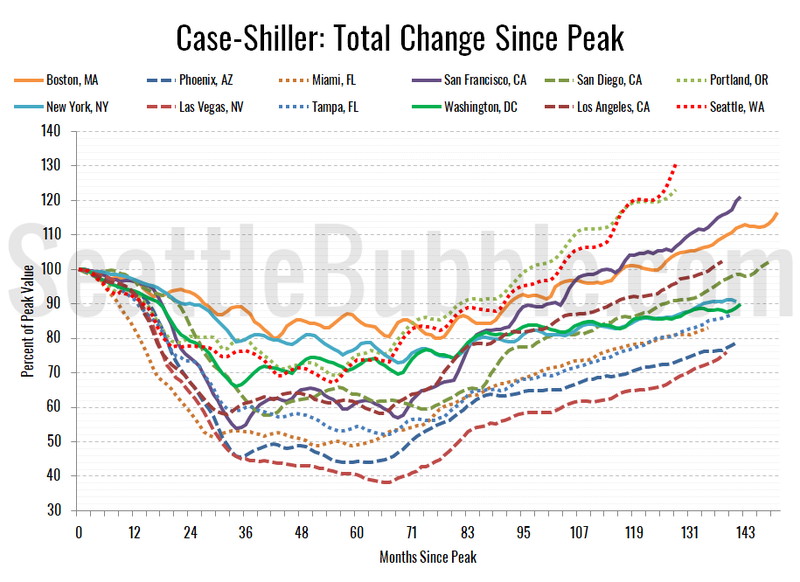 Seattle’s rank for month-over-month changes has been at #1 for three months. Seattle’s year-over-year price growth is still the highest in the nation. The streak has been alive for twenty months. Ten metro areas hit new all-time highs in April: Los Angeles, San Diego, San Francisco, Denver, Atlanta, Boston, Charlotte, Portland, Dallas, and Seattle. 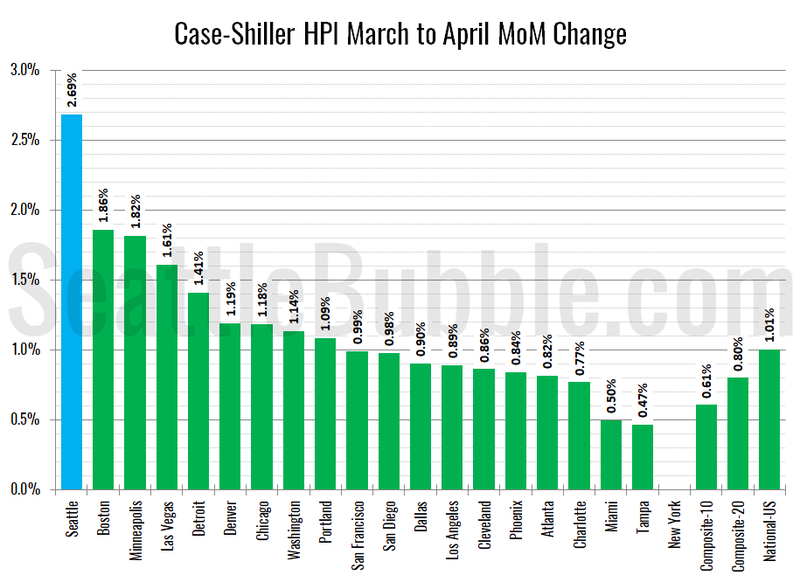 Here’s the interactive chart of the raw HPI for all twenty metro areas through April. 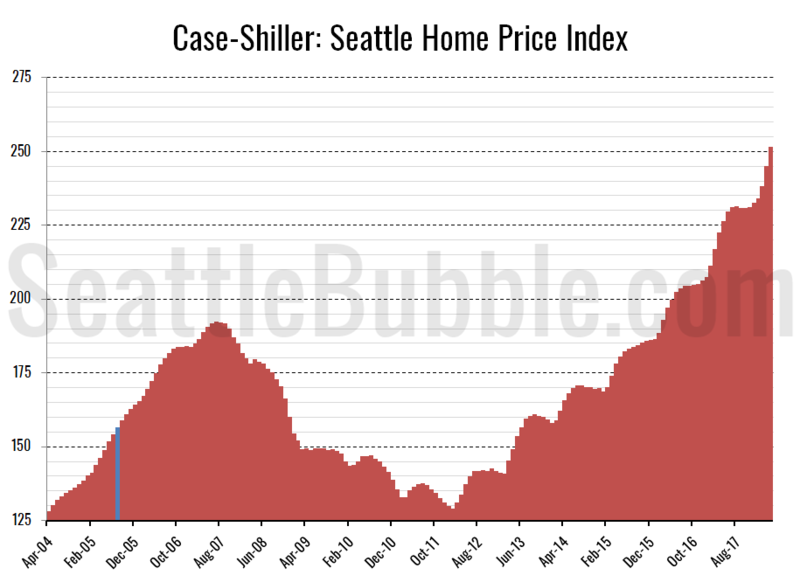 In the 129 months since the 2007 price peak in Seattle prices are up 30.8 percent. A couple decent homes in my area have been sitting for more than 2 weeks now, sign of the apocalypse? It’s enough to make a man think of upgrading. American Stocks got some relief too. The positive North Korea event helped there I’m sure. I thought the market was really slowing down (seeing blips like you suggested above) but for every sign of a lapse, I see another two that make me go “wow…that went for HOW MUCH? !”.I toured a home that was listed for quite a bit I thought… it was ok/decent, but the finishes and quality were not the best and it had a very specific design aesthetic …I really thought it would not sell quickly, especially with what I’ve been reading on here. Well, it went on the offer review date, straight to pending. I’ll be interested in seeing what it goes for. I was truly surprised. Anyway, it certainly doesn’t look good in the Fairwood area. At least, not for us! Here’s an example of a home I have noticed is sitting (well, 11 days) and appears to be decent when I look at the photos. On first glance, curb appeal is there, it has an attached garage, looks to be somewhat updated. I’m not going to comment on the actual finishes, etc because it gets pretty taste specific, but the kitchen appears quite small. Also, recent comps show that other homes within a few blocks in better condition have sold recently for less….100K less as in this example https://www.redfin.com/WA/Seattle/3417-39th-Ave-W-98199/home/128572 (home has no garage, just a carport but could be converted to garage for a lot less than 100K!) and this home has an extra .25 bath. I think that in this case, my point is that overpriced homes are still sitting. And we’ve been so conditioned to seeing an “okay” 3 bed, 1.75 bath home for almost a million dollars that its difficult to immediately identify (at least for me it is). Not sure where you are getting the “unfinished 540 sf” from. The AsBuilt including garage is 2,600. County records showing 1,170 on the main and 1,170 finished basement, so 2,340 of finished “house” looks correct to me. The other Cedar Shake Roof sale nearby on Bertona earlier this year makes this price look about right. Not too high or low, so not surprising it didn’t bid up the way Bertona did. Earlier in the year people were pricing lower (based on last year’s comps) and selling fast with bid ups. This time of year people are using the high bid up price as asking price comps, so normal for it to taper off by third quarter. I’m not saying there is no change and I’ve often said this or next season will be the end of the run up. But that house doesn’t offer anything surprising as to market condition even if it takes a bit longer to sell. It’s not a “3 bedrooms on one level” home, so the time on market looks pretty normal. Not sure where you are getting the “unfinished 540 sf” from. The AsBuilt including garage is 2,600. At first I thought that was a typo, because the garage is 260, but the 2,340 finished and 260 garage add up to 2,600. Not sure if that’s what you’d call a coincidence, since they aren’t the same, but being a multiple of 10 is odd. but this could be old, from the tax records and has since been finished. But that is what I was looking at. I think given the square footage, this is priced low…but it also looks out of date. But either way its now pending. I find that the County interface that Redfin and Zillow uses often comes up with errors. If that IS what the county says, then the improvements are made without permits. But that isn’t what the County says in this case. When it matters, don’t just do the scroll down method. Go directly to the King County Parcel Viewer. It shows correctly there. Why not pull it from the market until this settles down? Also, where are all these people with houses going on the market going to move? Where are all these people with houses going on the market going to move?